1. 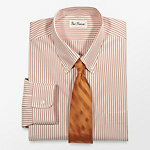 Our newest pinpoint oxford dress shirts combine fresh seasonal color with non-iron performance. Stay crisp and wrinkle free while vacationing from the daily humdrum of white and blue solids (though we’ve got those too) with colors like salmon, purple and orange bengal stripe. The buttondown collar looks neat with a tie or without.